This article is about the 8th Fighter Wing activated in 1948. For the 8th Fighter Wing of World War II, see 57th Air Division. The United States Air Force 8th Fighter Wing is the host unit at Kunsan Air Base, Republic of Korea and is assigned to Seventh Air Force. Seventh Air Force falls under Pacific Air Forces (PACAF). The Wing's 8th Operations Group is the successor of the 8th Pursuit Group, one of the 15 original combat air groups formed by the Army before World War II. 35th Fighter Squadron F-16DG Block 40F 89-2168 and CGs 89-2150 and 88-0504 in formation. Established in Japan after World War II in 1948, the wing flew combat missions throughout the Korean War. Redesignated the 8th Tactical Fighter Wing in 1958, it remained in Japan until 1964. After a year in California, it moved to Southeast Asia, where its F-4 Phantom II crews earned the nicknames "MiG killers" and "bridge busters". In 1974 the wing relocated to Kunsan Air Base, South Korea, where it was redesignated the 8th Fighter Wing in 1992. Established in August 1948 in Japan, the wing provided air defense to the islands. On 20 January 1951, the wing gained its new designation as the 8th Fighter Bomber Wing. On 25 June 1950, North Korea invaded South Korea, starting a war that would last three years. As the Korean War began, the 347th Fighter Group was assigned to the 8th to fly combat missions. The wing provided air cover for the evacuation of Americans from Korea on 26 June, the day after the invasion. Lockheed F-80C-10-LO Shooting Star 49-8708 of the 8th Fighter-Bomber Group, Korea, 1950. In these early operations, the wing flew the F-80 Shooting Star jet fighter and propeller driven aircraft such as the F-51 Mustang and F-82 Twin Mustang. The first aerial victory of the Korean War went to 1Lt William G. Hudson, of the 68th Fighter Squadron, All Weather in an F-82. Later the same day, 35th Fighter-Bomber Squadron F-80s scored the Air Force's first confirmed kills from jet aircraft. In August, the wing briefly reverted to the F-51 Mustang, returning to the F-80 in December 1950. Throughout the war, the wing principally conducted air-to-ground operations, providing close air support to United Nations ground forces and attacking targets such as supply centers and transportation assets. North American F-86F-30-NA Sabres of the 8th Fighter-Bomber Group, Korea, 1953. Serial 52-4877 in front in Wing Commander's colors, 52-4473 alongside. The 8th Fighter Wing is known for the heroic actions of its members, including Major Charles J. Loring, a pilot in the 80th FS, who was posthumously awarded the Medal of Honor for his actions on 22 November 1952 when he flew his badly damaged F-80 aircraft into an enemy artillery emplacement near Sniper Ridge so that entrenched U.S. Infantry men could escape. During the next three years, the 8th flew more than 60,000 sorties while operating from bases in both Korea and Japan. The wing participated in 10 campaigns and earned three unit citations. The wing finished the war flying the F-86 Sabre beginning in 1953 and became responsible for air defense over South Korea until relocated to Itazuke Air Base, Japan in October 1954. Its wartime participation in Korea earned the wing two Republic of Korea Presidential Unit Citations and ten campaign streamers, while the 8th Fighter-Bomber Group separately earned a Distinguished Unit Citation. During the war in Korea, the 8th shot down 18 enemy aircraft, most in the earliest days of the war before the wing's mission changed to air-to-ground operations. With the end of the Korean War, the wing was assigned to Itazuke AB, Japan for the next ten years. On 1 October 1957, the 8th Fighter-Bomber Group inactivated, with the flying squadrons then assigned directly to the wing. Less than a year later, on 1 July 1958, the Air Force redesignated the wing as the 8th Tactical Fighter Wing. During its tenure at Itazuke, the wing flew several different aircraft, including the North American F-86 Sabre, North American F-100 Super Sabre, Convair F-102 Delta Dagger, and Republic F-105 Thunderchief. As part of an overall effort to reduce the number of wings in Japan the wing's tactical squadrons were detached on 13 May 1964, and on 18 June 1964 all wing components except wing headquarters inactivated. McDonnell F-4D-29-MC Phantom Serial Number 66-0234 of the 435th Tactical Fighter squadron with laser-guided bombs on a mission north. Lockheed C/AC-130A-LM Hercules Serial 55-0029 of the 16th Special Operations Squadron, May 1974. 13th Bomb Squadron Martin B-57G from Ubon Royal Thai Air Force Base. 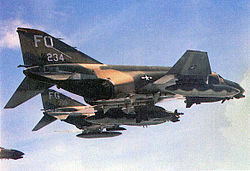 While at George AFB, the wing trained with the McDonnell Douglas F-4D Phantom II fighter aircraft and participated in numerous exercises, operational readiness inspections, and the like until the wing moved to Ubon Royal Thai Air Force Base, Thailand in September 1965 to commence combat operations in the Vietnam War. Top cover for 8th TFW whilst at Ubon and over Thailand was provided by F-86 aircraft of 79 Squadron, Royal Australian Air Force. 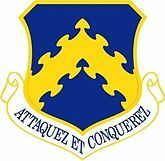 Note: The 555th TFS was reassigned to the 432nd Tactical Reconnaissance Wing at Udorn RTAFB where it would bring the unit up to strength. The 25th Tactical Fighter Squadron replaced the unit as the fourth F-4D fighter-bomber squadron at Ubon. "Wolfpack" aviators of the 8th Tactical Fighter Wing carry their commanding officer, Colonel Robin Olds, following his return from his last combat mission over North Vietnam, on 23 September 1967. The wing carried out a number of roles during combat. By the end of 1966, aircrews assigned to the 8th TFW flew nearly 14,000 combat missions into Vietnam. One of the squadrons assigned to wing, the 555th Tactical Fighter Squadron, became known as the "Ace" squadron of the conflict. During his tenure from September 1966 to September 1967, Col Robin Olds, Wing Commander, referred to his unit as the "Wolf Pack" because of pilot aggressiveness and teamwork while flying combat missions, much like a pack of wolves, which led to the wing's nickname. In May 1968, the wing was the first to use laser-guided bombs (LGBs) in combat. In October 1968, the wing picked up a Fast FAC assignment, under the call sign "Wolf". Building on lessons learned by the earlier "Misty" and "Stormy" Fast FACs, five picked air crews were trained by the end of November. They drew their Phantom IIs from the wing's aircraft pool, and used up unflown Operation Commando Hunt sorties to justify their missions. By December 1968, the "Wolf" FACs were flying 3.5 hour missions in the Steel Tiger area of the Ho Chi Minh Trail. In the face of communist antiaircraft fire, a prudent FAC operated at 5,000 feet altitude and jinked his craft constantly to confuse gunners' aims. The "Wolf" FACs flew six sorties daily between 15 November 1968 and 15 April 1969. However, the dangerous and tiring visual reconnaissance missions were an important part of the interdiction campaign against the communist supply line. In October 1969, 7th Air Force chose the 8th TFW for a night Fast FAC assignment flying interdiction against the Ho Chi Minh Trail. Flying under the call sign "Night Owl", the FACs dropped flares to illuminate air strikes against chokepoints along the Trail. They began operations on 18 October, and promptly lost two aircraft and crews when they collided with the ground while marking targets. Meanwhile, the antiaircraft threat to the FACs increased. In January 1970, 7th Air Force shut down the "Night Owl" FACs. During 1970, the Wolf Pack flew its 100,000th combat sortie. To make room for these forces, the 13th Bomb Squadron was reassigned to the 405th Fighter Wing at Clark AB, Philippines in December 1972. In December 1972, the 8th became involved in Operation Linebacker II. Designed to make the enemy more serious about the peace negotiations in progress at Paris, France, the 8th TFW launched 524 sorties for bombing missions against North Vietnam between 18–31 December 1972. Early in 1973, the Wolf Pack mission included air interdiction into Laos against communist insurgents in Cambodia. All combat operations ended on 15 August 1973. In mid-1974 action began to phase down at Ubon Airfield, Thailand, and the wing began to lose personnel, aircraft, and units. The last scheduled F-4 training flight occurred on 16 July 1974. The 433d TFS was inactivated in July 1974. The 25th TFS was reassigned to the 18th TFW at Kadena Air Base, Okinawa in July 1974. The 16th SOS was reassigned to the 388th TFW at Korat RTAFB in July 1974. The 435th TFS was inactivated in August 1974. The 497th TFS was inactivated in September 1974. With the exception of the 25th TFS's aircraft, the F-4D aircraft were flown back to the United States and reassigned to various Air National Guard units. The 8th TFW was transferred without personnel or equipment to Kunsan Air Base, South Korea on 16 September 1974, where the wing absorbed resources of the 3d Tactical Fighter Wing which had been reassigned without personnel or equipment to Clark AB, Philippines. For its efforts during the Vietnam War, the 8th TFW received four Presidential Unit Citations and five Air Force Outstanding Unit Awards. In addition, the wing led the Air Force with 38.5 MiG kills. In April 1975 the wing gained an air base squadron at Kwang Ju Air Base, often used during numerous tactical exercises. Following the killing of two U.S. Army officers by North Koreans on 18 August 1976, the 8th TFW went on increased alert and was quickly augmented by F-4Cs and F-4Ds from the 12th and 67th Squadrons at Kadena AB, Okinawa. The alert status relaxed on 8 September 1976 and the augmentation forces were released. F-16's from the 8th and 419th Fighter Wings awaiting takeoff, in an elephant walk formation. On 1 October 1978, the wing gained a third F-4D flying unit, the 497th Tactical Fighter Squadron, based at Taegu Air Base, South Korea. 497th TFS aircraft carried a red tail stipe. Operations continued unchanged for the next few years, until the wing transitioned from the F-4 to the newer F-16A Fighting Falcon in May 1981. The wing's first F-16 sortie was flown the following 18 September and, by 19 July 1982, the conversion of the 35th and 80th Fighter squadrons was complete as the last F-4 departed Kunsan. This aircraft conversion made the 8th the first active-duty overseas F-16 wing. On 1 January 1982, the 497th Tactical Fighter Squadron at Taegu inactivated. 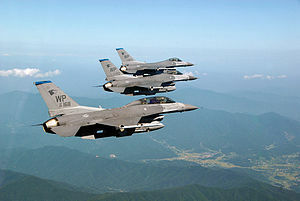 For the next ten years the wing used the F-16 to maintain combat readiness for the defense of Korea. In 1988 the F-16s were upgraded to the more capable F-16C/D models. While the overall mission remained unchanged, the wing reorganized on 3 February 1992. The wing became the 8th Fighter Wing. Further, the wing adopted a new organizational structure. Under the former Tri-Deputy organization system, the wing commander had three deputy commanders, one each for operations, maintenance, and resources. As well, the squadrons were assigned directly to the wing. 8th Fighter Wing Block 40 F-16D in training exercise. The 8th Fighter Wing entered a new era in November 2000. 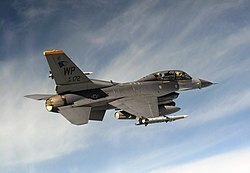 On 17 November, the 35th Fighter Squadron received its first Block 40 F-16s. The new aircraft carried Low-Altitude Navigation & Targeting Infrared for Night (LANTIRN) pods. The 35th completed its conversion in February 2001. The combination of LANTIRN and night-vision goggles has allowed the Wolf Pack to take the fight into the night. An inspection in November 2008 faulted the wing's adherence to technical orders and standards of documentation. As a result, on 10 November 2008 Colonel Bryan Bearden was removed as wing commander. Today the 8th Fighter Wing is composed of four groups each with specific functions. The Operations Group controls all flying and airfield operations. The Maintenance Group performs Aircraft and Aircraft support equipment maintenance. The Mission Support Group has a wide range of responsibilities with a few of its functions being Security, Civil Engineering, Communications, Personnel Management, Logistics, Services and Contracting support. The Medical Group provides medical and dental care. 16th Special Operations Squadron: 30 October 1968 – 8 December 1975 (detached 19 July 1974 – 8 December 1975). ^ Robertson, Patsy (6 February 2015). "Factsheet 8 Fighter Wing (PACAF)". Air Force Historical Research Agency. Archived from the original on 27 September 2015. Retrieved 14 October 2016. ^ Rowley, pp. 190 - 193. ^ Rowley, pp. 196 - 197. ^ Holmes, Erik (14 November 2008). "Col. firing linked to accountability push". Air Force Times. Archived from the original on 25 November 2014. Retrieved 9 February 2017. Schlight, John (1969). Project CHECO Report: JET FORWARD AIR CONTROLLERS IN SEASIA. Headquarters Pacific Air Force. ASIN B00ARRLMEY.